The Montalvo Arts Center is a prime location for wedding photography in San Jose, well-known to all of the city's residents and famous for its 175 acres of natural expanse, breath-taking views, and the Villa's singular Mediterranean-style architecture. Begin your wedding day portrait session a few hours prior to the wedding ceremony on the Villa's gorgeous veranda, which overlooks the verdant Great Lawn. Have your photographer arrange the bridal party on the stairs leading down to the lawn as you make your descent. A reverse angle with the villa now serving as a backdrop will make for a stunning portrait of the bridal party and will convey the majesty of the estate. 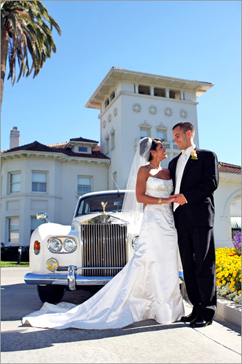 Arrange for your limousine to pick up the party at the bottom of the villa, next to the lawn, and direct your driver to take you to the Mountain Winery, another famed location for wedding photography in San Jose. Here you will find a number of locations with magnificent views of greater San Jose where your wedding photographer can assemble your bridal party or create an intimate portrait of the bride and groom. Both the Chateau Deck and Vista Point are great spots for a photo shoot. After finishing your rounds at the winery, have your limo driver take you back to the Montalvo Arts Center to complete your wedding day photography session on the great lawn (have the bridesmaids help the bride with her dress and veil, as the grass may or may not be damp). With the photography session complete, you can look forward to the rest of this unforgettable day! For the couple that loves to explore the exciting sites of the city, the elegant Hotel Saint Claire in downtown San Jose is the perfect location for a photography session on the day of the wedding. As a starting point, have your wedding photographer arrange the bridal party for portraits in the hotel's chic and stylish front lobby. 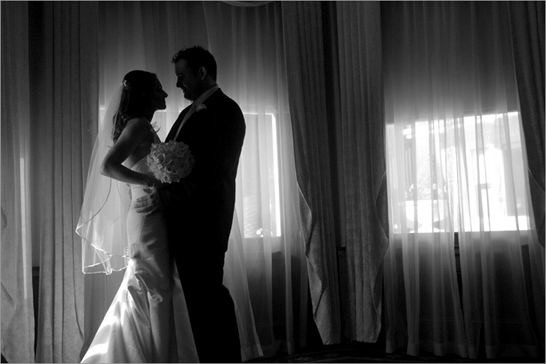 The entrance of the hotel also provides a tasteful backdrop for some photos of the bride and groom. Afterward, your party can stroll over just one block northwest and you will find yourselves facing the glittering fountains in front of the San Jose Center for Performing Arts. This is a great place for your wedding photographer to take some snapshots, particularly when the lighting is less harsh toward the evening. The steps at the entrance of the building are a great place to arrange the bridal party, as is the ramp that curves around the theater. Use the shimmering fountains as a backdrop for stunning portrait of the bride and groom, but remember to keep your distance for the sake of the wedding dress. 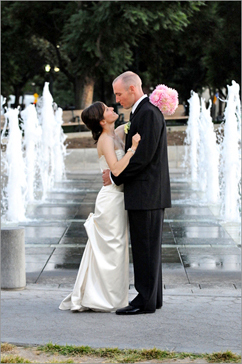 For more fountain photography fun, cross the street and have your wedding photographer capture some light-hearted moments at the Plaza de Cesar Chavez Park, in the heart of downtown San Jose. Here your photographer can assemble the bridal party on the lawn next to fountains. From this vantage point one can create photographs using any number of gorgeous backdrops, including the Tech Museum with its purple dome, the San Jose Center for Performing Arts, and any angle that captures the city's countless skyscrapers and hotels. If there are no children playing in the fountains (as is common), your wedding photographer can snap a few photos of the bride and groom in front of them. Having concluded your wedding day photography session, you and you bridal party can head back over to the Hotel Saint Claire for the ceremony and reception. If you've chosen to have your wedding ceremony and reception at Dolce Hayes Mansion in San Jose, you may not have to (or want to) look anywhere else to find picturesque photography locations for the day of the wedding. This gorgeous Belle Epoque-style mansion in south San Jose contains dozens of charming sites where the wedding photographer can situate the bridal party and the bride and groom. The most obvious location for a bride-groom portrait is the lush and majestic front lawn, where the happy couple can embrace with the mansion and its lofty palm trees in the background. The property's gorgeous front doors can also serve as a backdrop for a similar shot. The arched columns along the estate's adjacent wing are great for intimate or group photos. After exploring the outside of this historic landmark, have the bridal party make its way inside for some separate photos of the groomsmen and bridesmaids. Your wedding photographer can set up a portrait of the groom and his best buds beside the elegant bar, along one of the many stairways, or in one of the comfortable reading rooms. Likewise, the bride and her bridesmaids can gather at any of the aforementioned locations inside for a girls-only portrait. The mansion's exquisite dressing rooms can also serve as the setting for a few pre-wedding photos of just the ladies. After wrapping up your wedding day photography shoot in and around this enchanting site, get ready for the rest of the big day. It will surely be an unforgettable one!